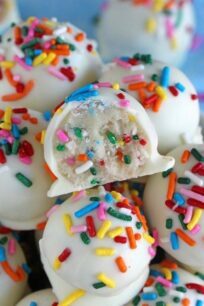 No Bake Cake Batter Truffles are very easy to make using funfetti cake mix. Loaded with lots of sprinkles and dipped in white chocolate, these are delicious. Cover a large, flat plate or cookie sheet with waxed paper and set aside. Slice butter into 8-10 pieces and add it to a large bowl, add funfetti cake mix, sugar, flour and vanilla extract. Using a fork, work the butter into the flour and cake mix until fully combined and it resembles smooth cookie dough. To make the process easier, mix with the fork and after that use your hands to combine all the ingredients. Measuring 1 tablespoon of truffle batter or using a 1 tablespoon cookie scoop, scoop dough and using your palms roll it into a ball. Place truffle balls onto the prepared baking sheet. Place in freezer for 10 minutes before coating with white chocolate. Add white chocolate wafers to a microwave safe bowl and melt for 30 seconds. Stir well and microwave for another 20 or 30 seconds, stir well with a spatula and if there is still chocolate that did not melt, microwave for another 10-15 seconds and stir well. Using a fork, dip each dough ball into the melted white chocolate and place on the prepared plate, top with sprinkles immediately. Place truffles in the fridge for at least 20 – 30 minutes or until the white chocolate coating hardens. Store truffles in the fridge for up to 7-10 days.